Write about yourself. A great history paper on the Civil War might be very well written, but it doesn’t tell me anything about the writer. 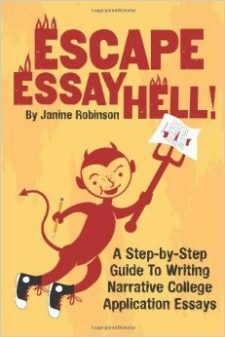 Regardless of the topic, make sure you shine through your essay. Use your own voice. I can tell the difference between the voice of a 40-year-old and a high school senior. Focus on one aspect of yourself. If you try to cover too many topics in your essay, you’ll end up with a resume of activities and attributes that doesn’t tell me as much about you as an in-depth look at one project or passion. Be genuine. Don’t try to impress me, because I’ve heard it all. Just tell me what is important to you. Consider a mundane topic. Sometimes it’s the simple things in life that make the best essays. Some of my favorites have included essays that reflect on the daily subway ride to school, or what the family goldfish observed from the fishbowl perched on the family kitchen table. It doesn’t have to be a life-changing event to be interesting and informative. Don’t rely on “how to” books. Use them to get your creative juices flowing, but don’t adhere too rigidly to their formulas, and definitely don’t use their example topics. While there are always exceptions, the “what my room says about me” essay is way overdone. Share your opinions, but avoid anything too risky or controversial. Your essay will be read by a diverse group of individuals from a wide range of backgrounds, so try to appeal to the broadest audience possible. Don’t repeat what is already in your application. If you go to a performing arts school and all of your extracurricular activities and awards relate to dance, don’t write about how much you love dancing. Tell me something I couldn’t know just from reading the other parts of your application. Finally, don’t forget about the supplements. The supplement questions are very important – you should plan to spend as much time on them as you do on your essay. A well-written essay won’t help if your supplement answers are sloppy and uninformative. College Application Topics That Work Best: The Unexpected!